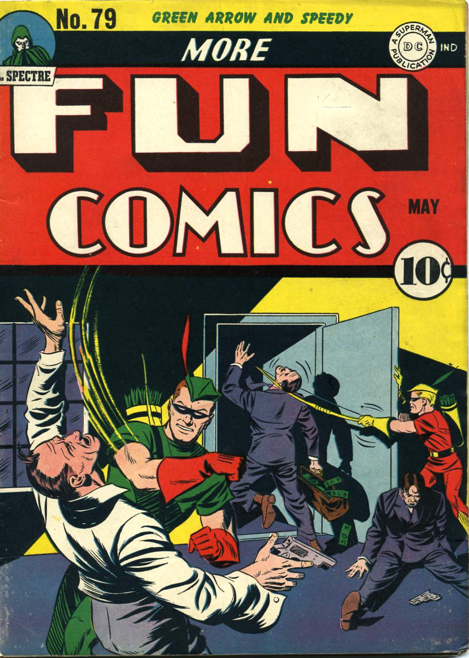 Green Arrow gets a new villain with a lot of potential in More Fun 79 (May 1942), but it seems they didn’t see it. He doesn’t make it onto the cover, nor did he appear again. The Boomerang is pretty much what Captain Boomerang would become, although much lower tech, appropriate to the era. 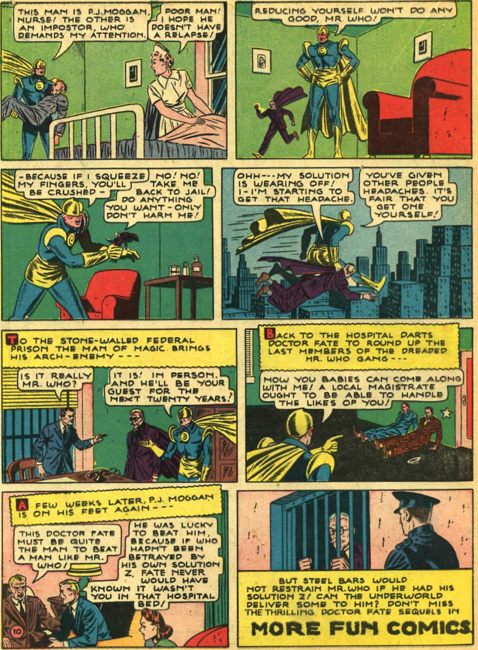 He uses boomerangs as, essentially, a hit man, giving people revenge killings. 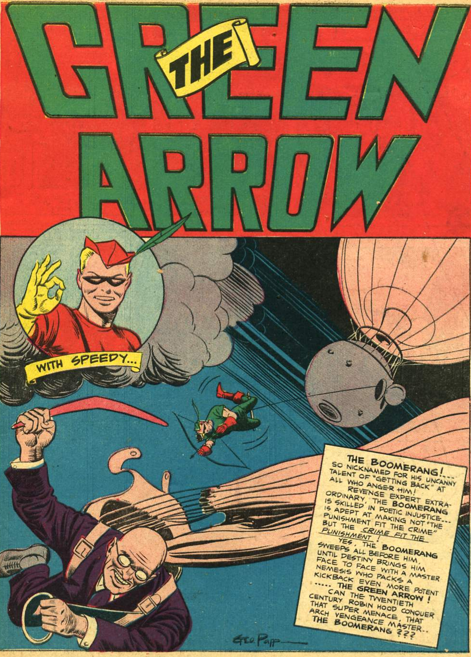 Oliver Queen gets alerted to this through his friends, and Green Arrow and Speedy hunt him down. No trick arrows, but a giant boomerang! 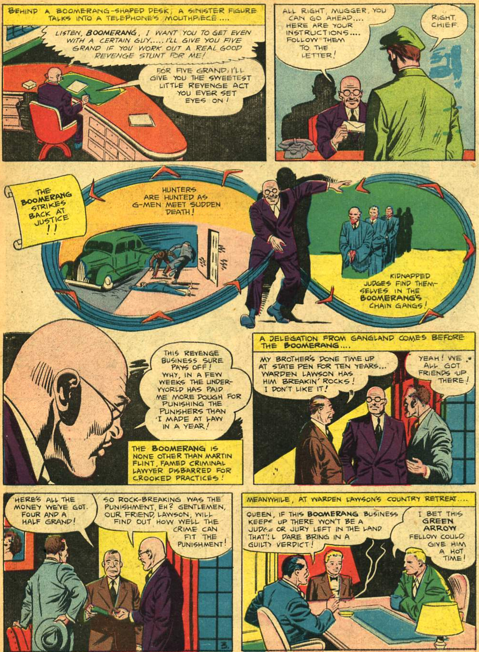 Mr. Who escapes from prison thanks to his “Z” formula, but overall it doesn’t help him much in this Gardner Fox/Howard Sherman story. 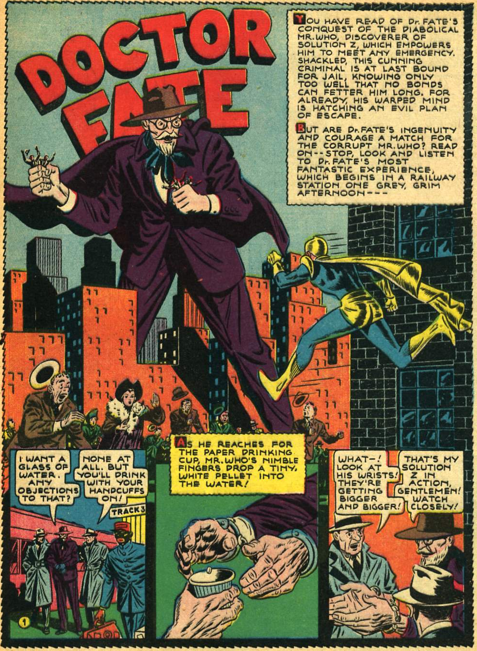 Mr. Who breaks into a millionaire’s home, and the formula allows him to take on the man’s identity, as it did with the mayor many issues ago. Kent and Inza are friends with the impersonated man, of course. Mr. Who’s own formula gives him away, making him grow large when Dr. Fate approaches him while he is in disguise. The last we see of Mr. Who, he is in prison. 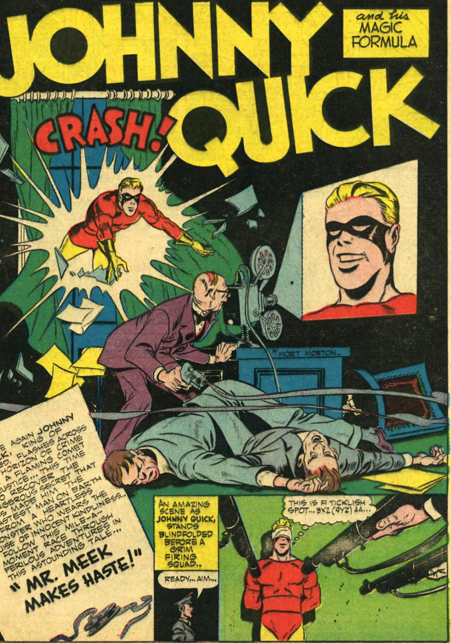 One would have thought he’d stay there, as he did not appear again in this series, but he did make a return, in a story set very shortly after this one, in All-Star Squadron in the 80s. 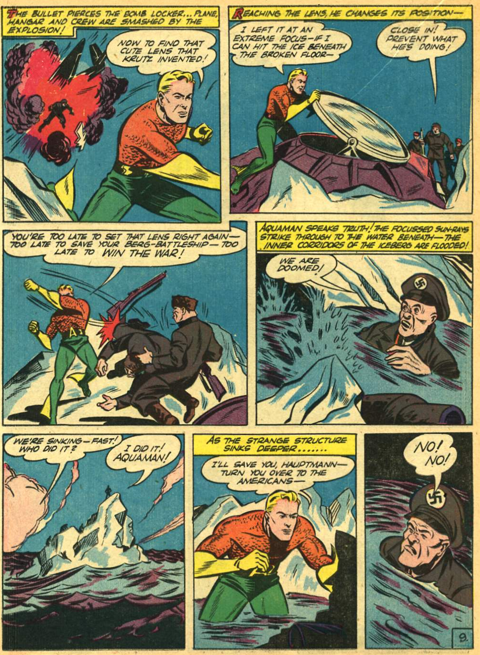 The only thing particularly noteworthy about the Aquaman story in this issue is that he is fighting Nazis. 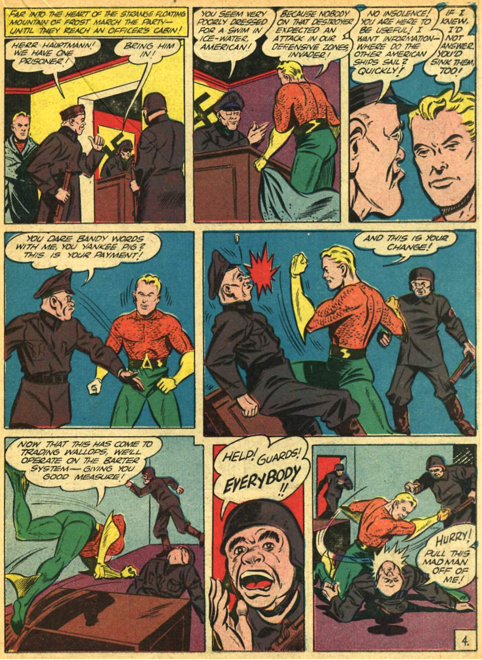 I think this story is still too early to have been written and drawn before the attack on Pearl Harbour, so it’s a bit surprising to see Aquaman being so aggressive with them. The story has him helping survivors of a Nazi U-boat bombing of their ship, while it was in protected US waters. 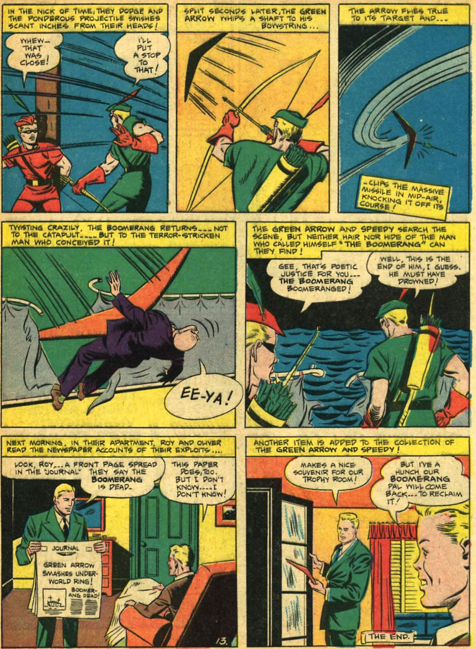 Aquaman identifies first and foremost as an American. Which, of course, he is at this time. 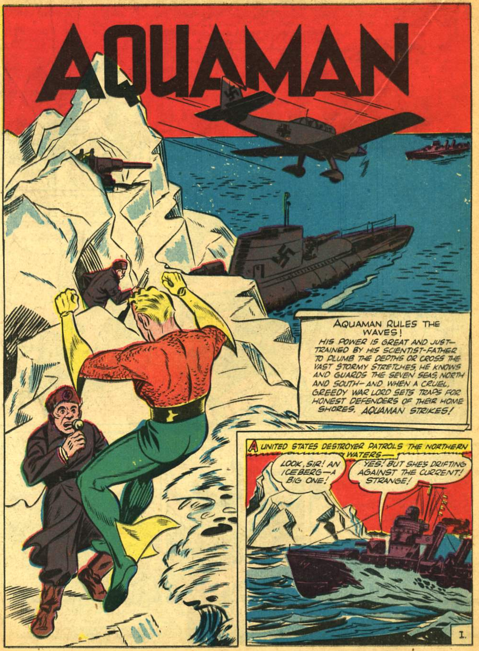 Odd to see a pre-Atlantean Aquaman though. 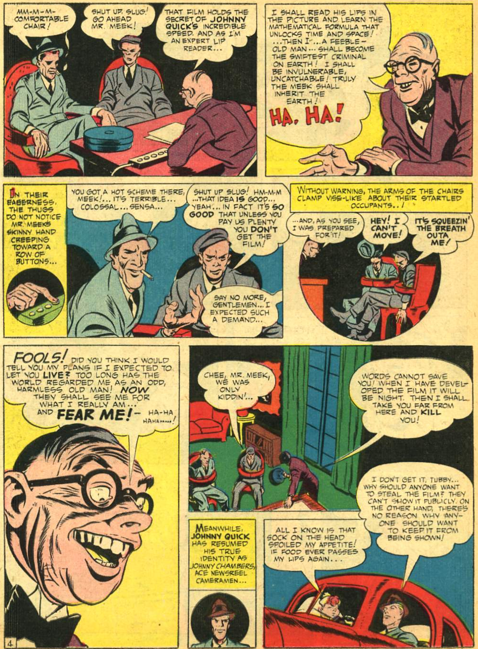 Mort Meskin’s art does a lot to make this story, which pits Johnny Quick against Mr. Meek, work as well as it does. Mr. Meek has the clever plan to film Johnny reciting his speed formula, so he can learn it and use it himself. Nicely ironic, as Meek is unaware that Johnny Chambers works making newsreels. The ending challenges Johnny’s wits, as he has to figure out how to use speed to escape a locked vault in a burning building. 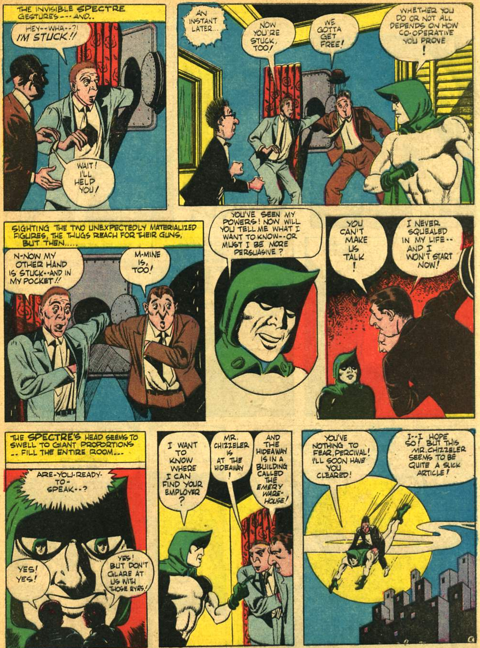 After a couple of issues that made it seem like the Spectre was taking his series back, Percival Popp moves solidly into the lead in this tale, by Jerry Siegel and Bernard Bailey. 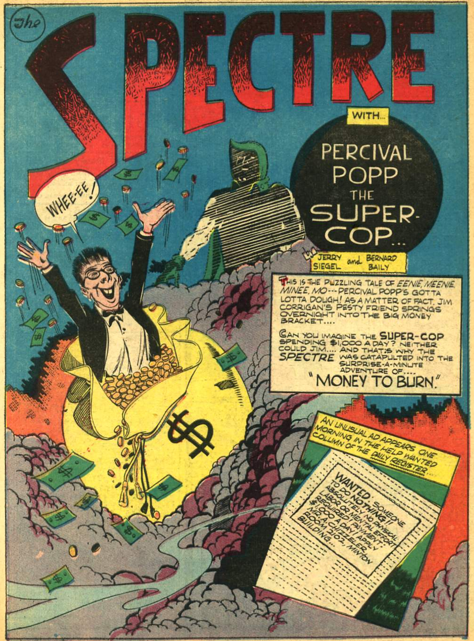 The Spectre isn’t even clearly seen on the splash page! 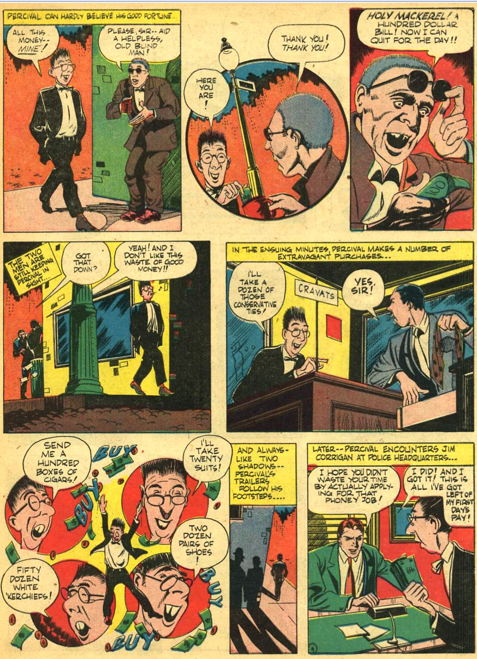 Percival takes a job spending money – the unwitting dupe of counterfeiters. 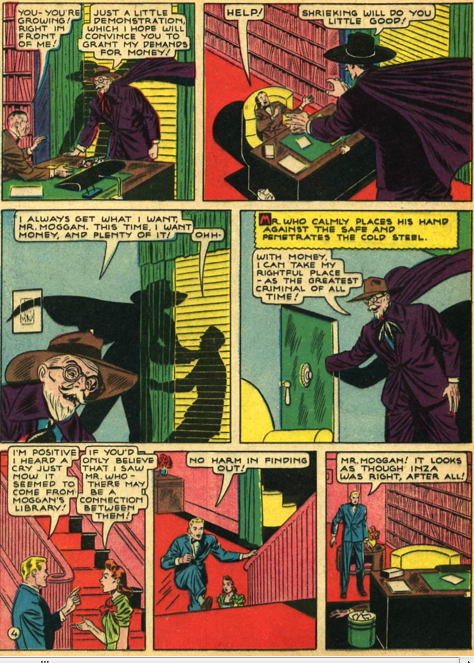 Jim Corrigan acts as his sidekick in this tale, until the Spectre is needed. 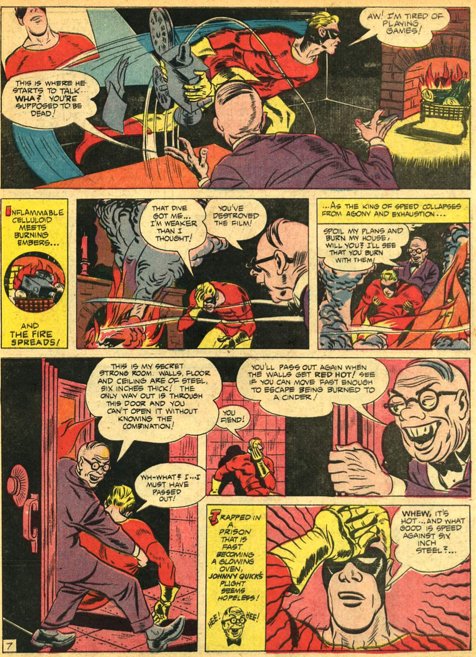 Then Jim changes form and devotes the rest of the tale to getting Percival out of trouble. Percival even gets to take credit for busting the ring! I feel sick.